Cool. I was researching a quasi-genre called “Acid Westerns” a few months back and saw this one mentioned as a possible example (along with “Dead Man,” “El Topo,” etc). Psychedelic movies are always so tough to do. In the 60’s, so many of them tried to shake loose of linear storytelling and ended up a complete mess. “El Topo” looks fantastic. I turn it on when I’m working out and leave the sound off. The imagery – as in the same film maker’s “The Holy Mountain” – is fantastic. Thanks for you post, Katydid! I agree Holy Mountain is awesome... so much so that El Topo seems like a dry run by comparison. Then again, as I say I've not yet made it to the end. For the great Alejandro, set and setting are key, and I've yet to get the dosage right for that movie. I agree about the 'psychedelic western' genre. Let's not forget about that Country Joe and the Fish movie, ZACHARIAH, another I've not seen. I'd also say there's some pretty trippy moments in THE NEW WORLD... which I saw only the first hour of... I did see all of DEAD MAN, but I've never really 'gotten' Jarmusch and his insistence on slow, empty go nowhere scenes. Might be worth seeing again, though.... thanks again! It's weird you posting this review just as Im starting to get into Moebius and his comics! I will definetly be checking it out and thanks for letting me know of its existense! I managed to survive all of RENEGADE aka BLUEBERRY and let's just say by the climactic 20 minute mind-trip, the director cranks up his style to a whole other psychedelic kaleidoscope of computer generated abstractions that threatens to overload the senses. After the ten-minute mark it gets to be a little much and after that point it becomes an endurance test. Still, I wouldn't mind revisiting it at some point just to let the 2001-like cosmic and spiritual awareness end stuff seep into my subconscious a little more. I think I need to see this one. I hear the Centipede God calling . . . I remember when this one came out. Kounen was riding high with the cult film community after Dobermann. That one had a "comic-book" style, as well, more like Pulp Fiction than Moebius. 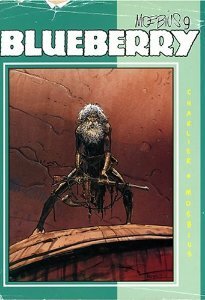 I never read Blueberry, but was well familiar with Moebius before going into this one. I bought the DVD from Korea (!) of all places. 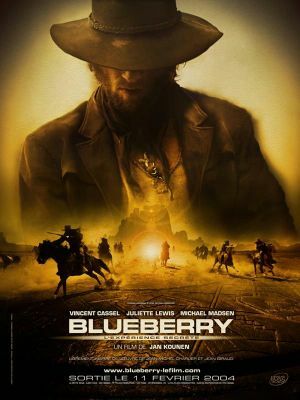 Like most of Moebius' work, there is a heavy spriritual component to Blueberry. This one takes a lot of trippy and surreal visuals, but it's really Faulknerian at heart--man in conflict with himself. Again I was in the small minority, I love Blueberry, love Kounen, love Cassel. Funny thing is Amando de Ossorio, of Tombs of the Blind Dead fame, is to have directed a Western where no one dies. Or maybe a shot is never fired. To me that is a trippy Western. Blueberry, El Topo, Matalo, Requiescant (aka Kill and Pray), and Django, Kill are some killer flicks, if you ever get in the mood, Erich. Always enjoy reading your writing, and hope all is well. a documentary from the same director.